I grow really fond of my cooking tools. Most of the Mexican ones have come straight from Mexico. Some have been passed down from my family, like the comal my mom gave me in hopes I would become a good cook. Some I have shamelessly taken, like the lime squeezer, which comes from her kitchen, too. The many wooden spoons I have come from different regions in Mexico and have come tucked in my suitcase. As for the molcajete, I asked my father-in-law to get me one from the Mexico City market, and he lugged it for me in his carry-on bag (he reminds me to this day…). Yet, I found my tamalera, a special pot for steaming tamales, here in DC! When my dad visits from Mexico, ever since we moved to the U.S., he has brought some for me. And I didn’t start making tamales at home, until I had kids. First, I used a vegetable steamer. Once I moved to DC, I found this one at Panam, the mostly Mexican (Latin) grocery store on the corner of 14th Street and Parkwood. 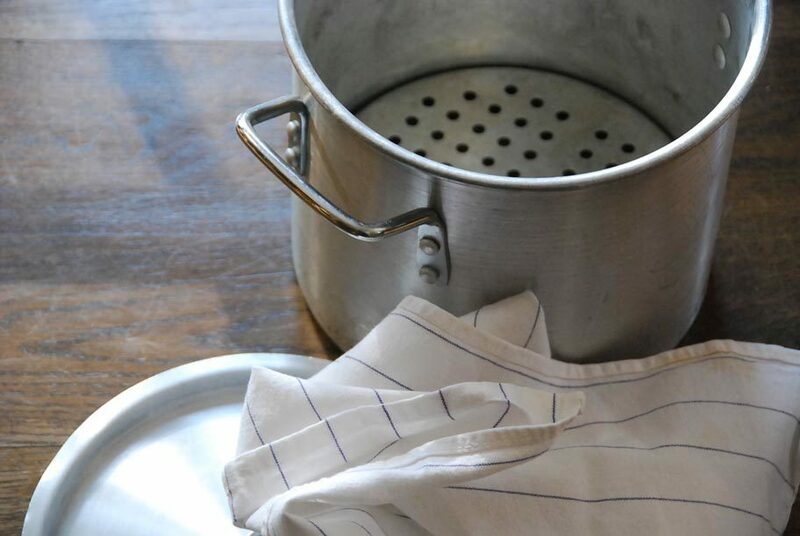 Yes, you can improvise and steam tamales in a seafood or lobster steamer, a Chinese steamer, any steamer, or even a pasta pot if it has an insert that sits above the bottom. However, the tamaleras are one of a kind. No wonder: Mexicans have been steaming tamales since pre-Hispanic times, so it’s no surprise the Mexican tamalera outdoes all other steamers when it comes to cooking tamales. See above, the tamalera has three parts: the pot, the lid and a stand. The tamalera is tall for setting the tamales upright. It has a removable, perforated platform or stand to place the tamales on so they sit above the water. It is sturdy: if you pack it up with tamales it gets heavy! 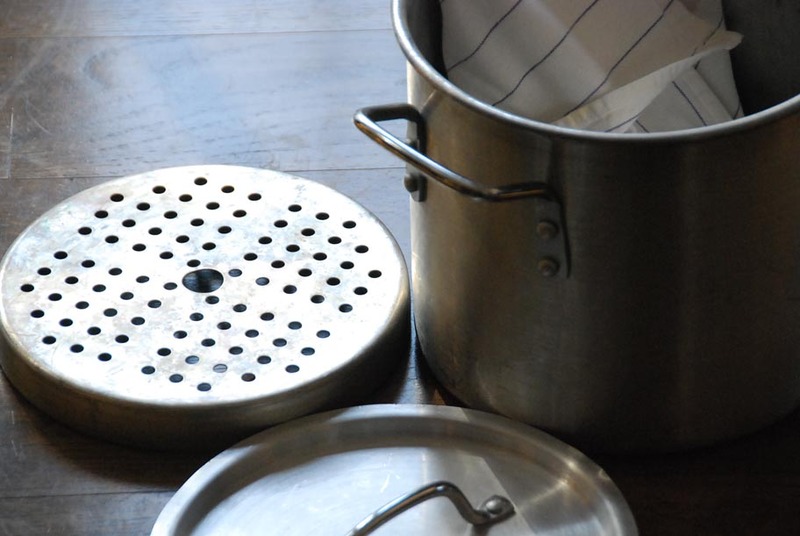 Tamaleras are also fitted with lids for keeping the steam in, which is so vital for even cooking of tamales. 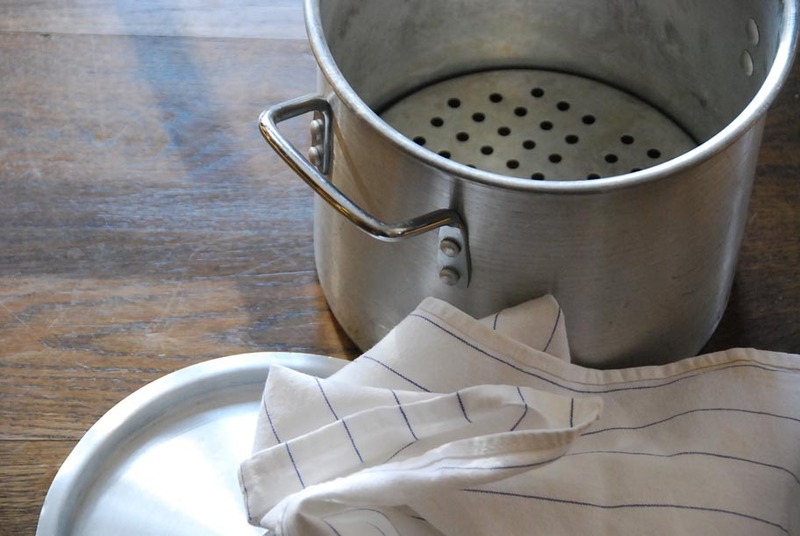 Yet, I tend to pack it up with tamales and cover it with extra husks or leaves, so many times the lid won’t close tight, so… I wrap a towel through the handles, so there will be no steam escaping. But if I did what I need to do: get a bigger tamalera, I wouldn’t need to worry about that towel. I love the improvisational lid solution. 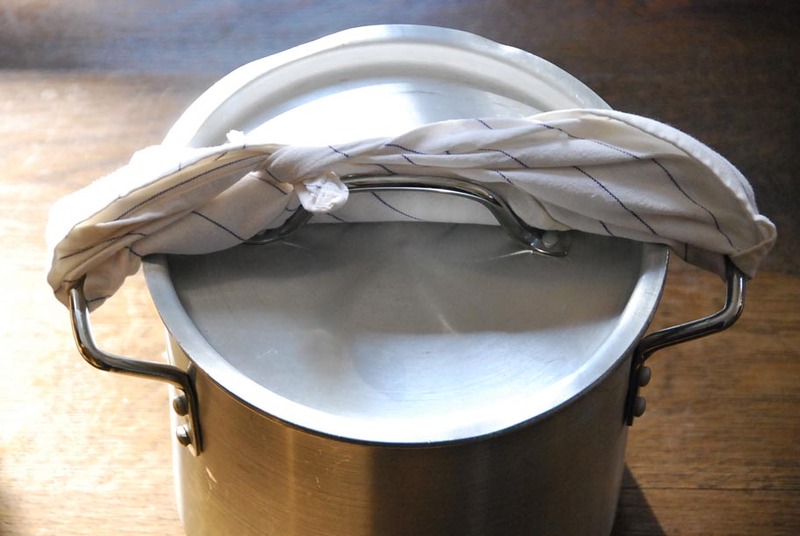 I didn’t realize how important it is to tightly seal the pot during steaming. I use an ancient cast iron flat griddle pan from my husband’s Louisiana Cajun ancestors as my “comal”. I’m sure it’s an antique but I think it works great. I’ll have a chance to use a real comal on my upcoming trip to Mexico so I can compare the two. I’m so excited! Thank you, Pati, for educating me so much about what I’ll see and eat there. I need to know how to stack them in the tamalera and how long to cook the tamales in the tamalera? While looking through the PBS channels, I discovered your show. Love it! You inspired me to try making my own tamales after reading your recipe. Followed your directions and used seasoned vegetable oil the first time using a vegetable steamer. The taste was surprisingly good but the consistency wasn’t quite right. I threw caution to the wind and purchased organic leaf lard to use the second time. Used my pasta pot with the insert thinking the cooking would be much more even. This time the flavor was awesome but the tamales again weren’t cooked perfectly. I know I’m doing something wrong but just don’t know what. I’m hoping you’ll do a tamale making episode or have made one I can watch because I really want to get these right. So looking forward to season #4! Yes I am! There is a TAMAL episode. Stay tuned. I love watching your program. And I like your rustic dishes too. Are all of your dishes from Mexico? I would love to have some of my own. I do have a molcajete that I had since 1990 and it is well seasoned. I am going to make your fried red snapper over salad and salsa dishes soon. It looked so good. I can’t wait to try it. And I am very passionate about the food I cook too. I am not Hispanic nor Italian, but I come from a long rich family line of wonderful cooks. And because I live in a rich multi-cultural community, I’m learning new ways too cook and experimenting with different ingredients all the time. I have so much fun cooking. When I cook for the one’s I love, their enjoyment of the dishes I make, gives me so much pleasure. And I can see that in you when I watch how you cook and when I listen to your wonderful history of family and home. You are a treasure! Thank you, Laura! Nice tip, with the upside down molcajete! Speaking of cooking tools, can you please tell me where in the world you got the triple-spout glass measuring cup? I’ve been looking everywhere for one like the one you use on the show. I’m right-handed and my mother is left-handed. That measuring cup would be awesome for us both. It was a gift from a dear friend, a long time ago…. It is VERY handy though! Have you tried looking online? Thanks for the response. I’m still looking. I married into the Spanish community, my first Christmas was something else. My mother in law, who couldn’t speak very much English, ushered me into the kitchen to find two nescos on the table. I know your smiling now, yes one had a pigs head and one had a cows head. What did I get into. I loved every minute of the time I spent there. unfortunately my husband passed a few years later and I did not learn all I wanted to. So now I watch your show, Rick Bayles’s show to learn all I can. I have attempted Tamales by myself turned out so so. I do a wicked Menudo. and have just got the hang of chicken mole. Once again, this site excels. Pati’s recipes and descriptions are treasures themselves, and then things get better with all the other great responses here. Years ago I bought a small tamalera at Violeta in Oaxaca that is my great friend. It is galvanized and has a small port near the bottom so you can add hot water when the level gets low. Thus you can leave the top closed when adding water. Thank you so much for your message and thank you so much for your recommendation on the clips! I will try them out! i add chile to my masa and it adds more flavor to the tamales. My Nana was from Sonora so we say, tamales, estilo de Sonora. LOL I also put a black olive in each tamal, and use half California, half New Mexico chile. I make a mix of pork and beef for the filling. That’s how my mom taught me. I’m going to try your version. from sunny Southern Cal!! Your tamales sound delicious! I love adding chile to the masa as well. So many possibilities! Hope you like this one, which is very popular in Central Mexico.